The government of Maharashtra has signed a MoU (Memorandum of Understanding) with the British Council to strengthen educational and cultural cooperation between the two nations. The announcement has been made at comes when the UK's international culture and educational arm completes seventy years of its existence in India. 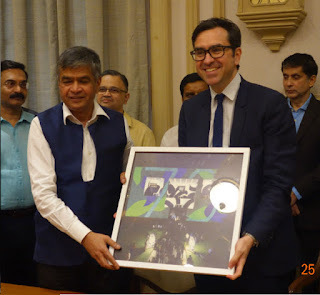 The agreement was signed by Sumit Mullick, Chief Secretary, state government, and Alan Gemmell OBE, Director British Council India. The MOU’s areas of work highlight the work of the British Council over the last 70 years, which were referenced by Hon’ble Prime Minister Modi during his visit to London last week. It is the 70th anniversary of the British council in India which has been working to train teachers, deliver skills programmes for youth, and support cultural exchanges. Under this new agreement, British Council would be training 30,000 teachers in the English language in the state. The training will be funded by Tata Trusts. With this MoU, the British Council hopes to expand its existing work in the state. In the recent times, it has trained more than 100,000 teachers benefitting around five million learners. The focus of the MoU would be in developing further initiatives to improve English teaching and enhance employability skills in schools and training institutes, building capacity in higher education and research and further co-operation on inspiring hundreds of thousands of people in the state through arts and culture. The British Council is aimed to support CM Devendra Fadnavis’ vision for the youth of the state. With this MoU the youth of the state are expected to be more employable nationally and internationally, have better learning outcomes for school students, seek greater cooperation in the higher education sector, and enhance cultural collaboration between Maharashtra and the UK. Young researchers and students from the State have been travelling regularly to UK for higher education and professional development through Scholarships from the UK.